One change Topbox made this month is that they are no longer sending a paper product card - you will now get it emailed to you around the time that your bag ships out. This helps them send out electronic links to where you can buy the products! Also, they changed to purple foil bubble mailers instead of the past signature Topbox mailer, but they are very similar. This month looks a little heavy in the skincare department, but let's take a closer look at the goodies inside! O.R.G. Skincare Mineral Peel Face - Deluxe Travel Size ~ $6.95. For an instant glow, look straight to our Mineral Peel. The facial and makeup prep exfoliant features natural brightening agents and is the first all-natural enzyme peel that extracts dermal debris and dead skin within seconds of application – for instantly smoother, brighter, skin. Radiance is literally seconds away. This is interesting - I have not seen a spray on face peel before! This sounds fairly easy to use and I like face peels (I use them once every 2 weeks) and this one suggests you could even use it 3-4 times per week. It sounds like it will be a gentle peel, but I will report back! 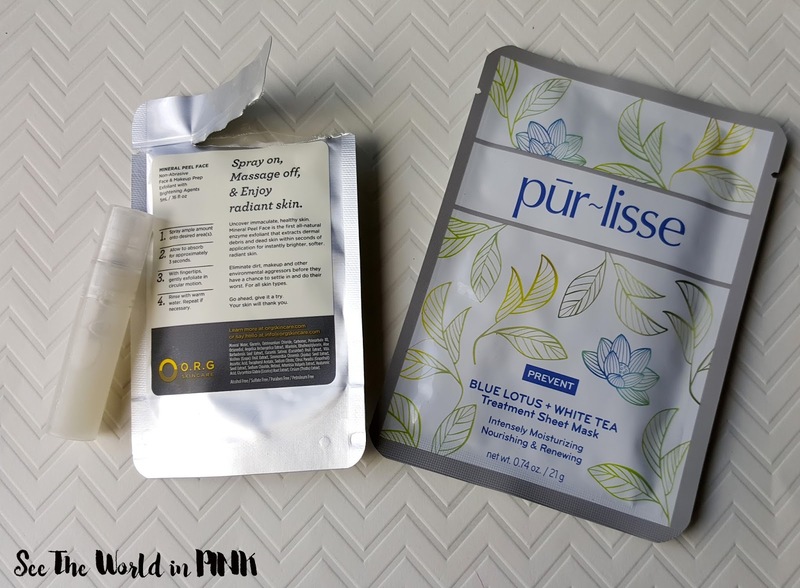 Pur~lisse Beauty Blue Lotus + White Tea Sheet Mask ~ $8.00. This natural fiber mask infused with Blue Lotus, White Tea and restorative Asian botanicals delivers antioxidants and minerals to your skin. This power blend fights free radicals, improves skin texture while White Mulberry brightens and Anise helps firm skin, leaving complexion healthy, beautiful and youthful-looking. I have actually received this mask in a past Ipsy bag and I reviewed it on a Skincare Sunday post - you can see my full review here! I was quite happy with the mask and thought it made my skin look great, so I will happily use this! 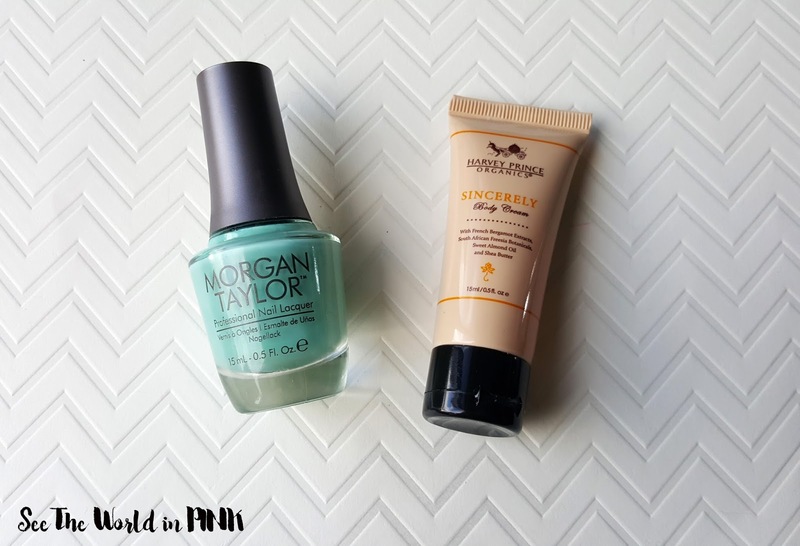 Morgan Taylor Professional Nail Laquer in "Postcards From Paris" ~ $15.83. It's what's inside that counts. Inspired by luminous pearls, raw gems, semi-precious stones, glimmering silvers and radiant gold all drawn from the earth. All pigments are saturated, pure and finely milled for luminous metallics, never before seen shimmers, decadent crèmes, stunning sheers and more glistening glitters. This is the 2nd Morgan Taylor nail polish I have received from Topbox in the past few months, but this colour is really great! I really love it! I do think it's a little weird that I can't really find Morgan Taylor online, but again this is a pretty colour so I'm not too worried about it. Sincerely Body Creme - Sample Size ~ $3.00. Revitalize, soften and soothe your skin’s dry, rough patches with our hydrating Sincerely Body Cream. An intensely moisturizing and deeply nourishing blend of Shea butter and sweet almond oil, combined with extracts of French bergamot and South African freesia, Sincerely Body Cream brings out your body’s natural luster, giving you silky smooth skin all day long. Infused with Harvey Prince Sincerely perfume. This is probably 1 product I'm not thrilled about - I'm fine with lotions (I use them a lot) but I haven't liked a single scent from Harvey Prince and I'm not a fan of this specific scent. It's probably not really worth it to pass on so I will use it but blah. Topbox came with 4 products this month (4 full size - because both travel size items were for sale on their websites, I count them as full size) with a total value of $33.78! This is around the normal average value for Topbox - which is good for me! I am happy with 3 of the 4 items, but I will use all 4. 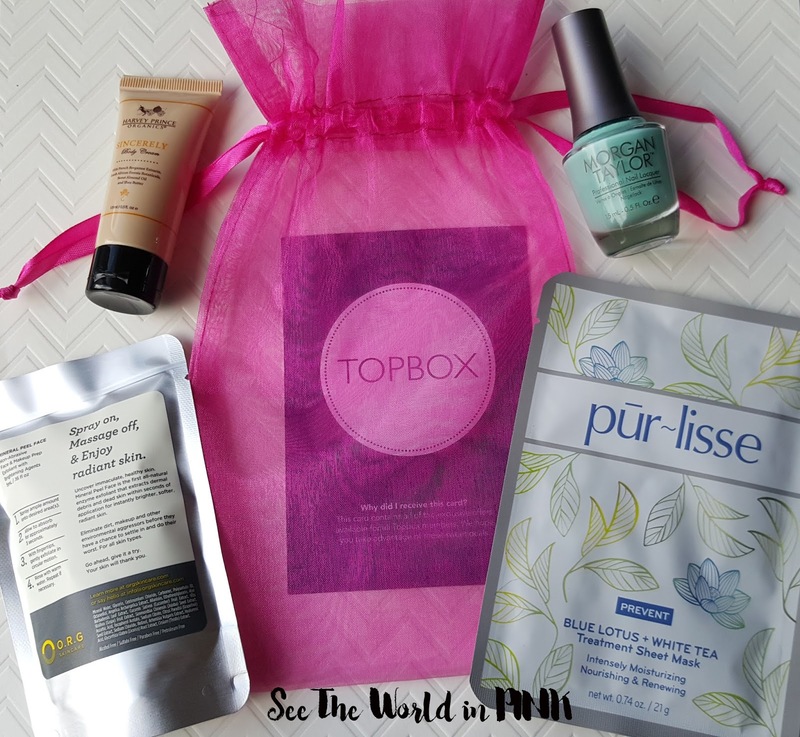 This bag was a little heavy on skincare this month and I do prefer to receive at least 1 makeup item. What did you think of the June Topbox? Did you get the same products? I received the face peel and the sheet mask which I'm excited about, as well as a dry shampoo (love!) and an ugly blue eyeshadow that I had just received in my Luxe Box. I also received that Harvey Primce hand cream and a Morgan Taylor nail polish in my Luxe Box. So much for those two businesses acting as separate entities when they merged! I ended up cancelling both subscriptions and joined Ipsy again instead. Yes I knew there would be a problem when the 2 companies merged - that's why I cancelled Luxe Box, there was no way there wouldn't be any repeat items! I have been really happy with Ipsy lately!